Asylums. Electro-Shock Therapy. Skull Drills. Pills. Exorcisms. Isolation. Lobotomies. Many of the drastic procedures that have been put in place to relieve a person of mental illness are only successful in creating ‘vegetables’ out of patients, not curing their illness but making them ghosts of their previous selves. Throughout history, there have been radical changes in how the mentally ill are treated and cared for; most of these occurred because of changing societal views and knowledge of mental illness. These changes have brought psychiatrics out of a negative light and have given psychiatric studies a brighter, more positive outlook. In the ancient world cultures, a well-known belief was that mental illness was “the result of supernatural phenomena”; this included phenomena from “demonic possession” to “sorcery” and “the evil eye”. The most commonly believed cause, demonic possession, was treated by chipping a hole, or “trephine”, into the skull of the patient by which “the evil spirits would be released,” therefore healing the patient. Although ancient Persians also believed that the illnesses were caused by demons, they practiced precautionary measures such as personal hygiene and “purity of the mind and body” in order to “prevent and protect one from diseases”. During the 5th and 3rd centuries B.C.E., the Greeks changed the way that psychological disorders were viewed. The philosopher and physician, Hippocrates, discovered that illnesses come from “natural occurrences in the body” (Foerschner). As Hippocrates was studying mental illness, he stepped away from the superstitious beliefs and towards the medical aspect of it. He studied the pathology of the brain and suggested that mental illness stemmed from imbalances in the body. These imbalances were in the “four essential fluids”; blood, phlegm, bile, and black bile which produce “unique personalities of individuals.” In order to restore the body’s balance, the Greeks used techniques such as phlebotomies, bloodletting, purging, and imposing diets on the afflicted (Foerschner).One treatment that Hippocrates advocated was changing the occupation and/or environment of the patient. Although these treatments had gained popularity amongst most cultures, there were still vast majorities of people who believed in the supernatural causes of mental illness and used treatments such as amulets, talismans, and sedatives to “ease the torment” of the afflicted (Foerschner). Historically, those with mental illnesses had a “social stigma” attached to them. It was believed that “a mentally ill member implies a hereditary, disabling condition in the bloodline” threatening the family’s “identity as an honorable unit”. In countries, or cultures, that had strong ties to family honor, such as China, the ill were hidden by their families so that the community or society that they were a part of wouldn’t believe the illness was “a result of immoral behavior by the individual and/or their relatives”. As a result of this social stigma, many of the mentally ill were forced to either “live a life of confinement” or were abandoned and forced to live on the streets. Any of those that were abandoned to live on the streets and were rumored “dangerous and unmanageable” were either put in jail or dungeons, out of the public eye (Foerschner, 1). According to Dr. Eve Leeman of the New York- Presbyterian Hospital, the social views on the sexes also affected the treatment of patients, particularly women. In the early 20th century, women were “preferentially sterilized and lobotomized” and were sometimes even subjected to unnecessary procedures such as the five women in the Stockton State Hospital who were given a clitoridectomy. The justification for these procedures was that having a mental illness was “unladylike” and required “surgical intervention” (Leeman). These negative perspectives of the mentally ill were maintained throughout history and into modern societies as shown by Nurse Ratched’s treatment of the patients in One Who Flew Over the Cuckoo’s Nest (Kesey). Throughout the novel, Nurse Ratched abuses her position and uses her power to submit her patients to cruel treatment as punishment for misbehavior. This is due to the fact that she doesn’t see her patients as human beings but as animals who need to be trained. In the early 15th century many of those afflicted with psychological disorders were placed in workhouses, madhouses, or asylums because it was too burdensome for the families to care for them. The state of these institutions was abhorable. Those that were admitted to madhouses were abused and often abandoned by their caregivers who were not trained in the treatment of mental disorders. Private madhouses, however, were often run by clergy men and were significantly more humane. The treatments instituted by the clergymen included regular church attendance, pilgrimages, as well as priests solacing individuals to confess their sins and repent. Asylums, on the other hand, were incredibly inhumane in the treatment of their patients. Many of those admitted were abused, abandoned, treated like animals, restrained with shackles and iron collars, cared for by untrained staff, and even put on display. An infamous example of the horrors of early asylums would be La Bicetre. In this French asylum, patients were shackled to walls with very little room to move, were not adequately fed, only visited when brought food, their rooms were not cleaned, and they were therefore forced to sit in their own wastes. Another example would be Saint Mary of Bethlehem, an asylum nicknamed “Bedlam” due to its horrific treatment of the mentally ill.
Their “violent” patients were on display like “sideshow freaks” and their “gentler” patients were forced to beg on the streets. Patients who were allowed to be visited by family often begged their families to be released, however, since the current stigma of mental handicaps was so negative, their pleas would be ignored. Treatments in these asylums, as well as others, included purging, bloodletting, blistering, dousing patients in either boiling or ice-cold water to “shock” them, sedatives, and using physical restraints such as straitjackets (Foerschner). Due to the obviously horrific treatment of patients in asylums, many reforms began to take place starting in the mid-to-late 1800s. Two reformists greatly influenced the spread of what is known as the “Humanitarian Movement,” the first being Phillipe Pinel, in Paris. Pinel believed that “mentally ill patients would improve if they were treated with kindness and consideration” instead of filthy, noisy, and abusive environments; he implemented his hypothesis when he took over La Bicetre. Another major reformist, William Tuke, founded the York Retreat where patients were treated with “respect and compassion” (Foerschner). After Tuke and Pinel, came Dorothea Dix who advocated the hospital movement and in 40 years, got the U.S. government to fund the building of 32 state psychiatric hospitals as well as organizing reforms in asylums across the world (Module 2). The Hospital movement started in the 18thcentury and was justified by reasons such as: “to protect society and the insane from harm, to cure those amenable to treatment, to improve the lives of the incurable, and to fulfill the humanitarian duty of caring for the insane” (Dain). Along with the creation of state psychiatric hospitals, various organizations and acts, such as Mental Health America (MHA) and the U.S. Community Mental Health Centers Act of 1963, were created to “improve the lives of the mentally ill in the United States” (Module 2). With the reforms came the increase in psychoanalysis. Sigmund Freud, who is referred to as the father of psychology, was, basically, the creator of psychoanalysis. Freud wrote the Psychoanalytic Theory in which he explains “the id, the ego, and the superego” as well as therapeutic techniques such as hypnosis, “free thinking”, and dream analysis (Foerschner). Freud believed that allowing a patient to focus on repressed thoughts and feelings, he could cure the patient of his/her disorder. One form of psychoanalysis had goals to help and individual “identify and achieve their own goals” and would keep patients occupied and “thus cure them from delusions and irrationalities” (Dain). 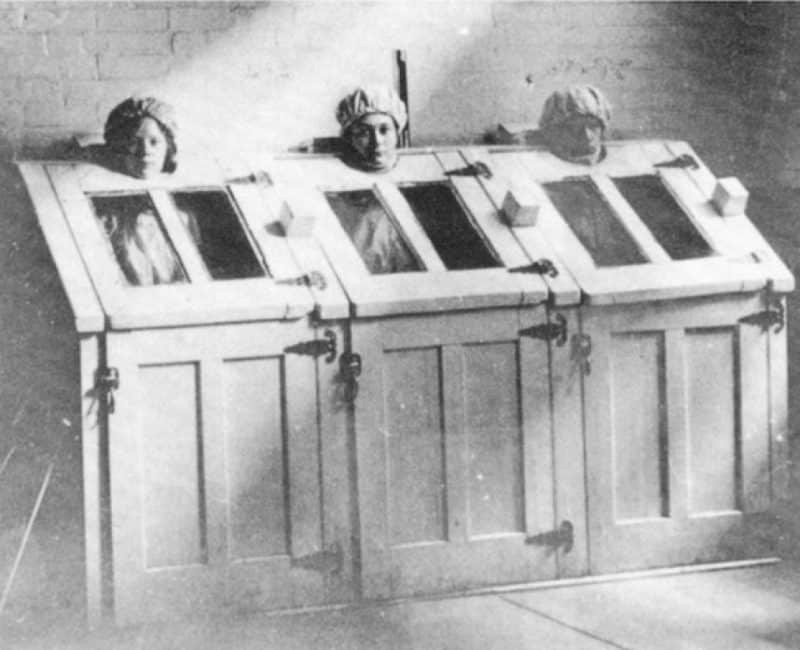 Lastly, Somatic treatment was introduced in asylums which included psycho-pharmacology, psychosurgery, electroconvulsive therapy, and electric shock therapy, among others. The first non-sedative drug used in the treatment of patients was chlorpromazine which “cured” many mental ailments and patients “became free of symptoms entirely and returned to functional lives” (Drake). The introduction of pharmacology led to the deinstitutionalization reform which changed the view from institutionalized care to “community-oriented care” to improve the “quality of life” (Module 2). According to Foerschner, this backfired and led to 1/3 of the homeless population being the mentally ill. Many of the treatments enacted on mentally ill patients throughout history have been “pathological sciences” or “sensational scientific discoveries that later turned out to be nothing more than wishful thinking or subjective effects” and haven’t actually benefited those being treated. As the social perspectives and knowledge have changed, so has the treatment of those afflicted with mental pathologies. These treatments will continue to change as the world expands on its knowledge of brain pathology. As Leeman says, “mental illness is not accurately described as a disease of the mind or brain and… treatment must attend to the whole patient” so as we continue forward in our knowledge of psychology we must learn from “the foibles of earlier generations” (Leeman). Dain, Norman, PhD. “The Chronic Mental Patient in 19th-Century America.” Psychiatric Annals 10.9 (1980): 11,15,19,22. ProQuest. Web. 25 Sep. 2014. Drake, Robert E., et al. “The History of Community Mental Health Treatment and Rehabilitation for Persons with Severe Mental Illness.” Community mental health journal 39.5 (2003): 427-40. ProQuest. Web. 25 Sep. 2014. Foerschner, Allison M. “The History of Mental Illness: From ‘Skull Drills’ to ‘Happy Pills’.” Student Pulse 2.09 (2010). Kesey, Ken. “One Who Flew Over the Cuckoo’s Nest”. New American Library, 1962. Print. Leeman, Eve. “Mental Illness: Learning from the Foibles of Earlier Generations.” The Lancet 351.9100 (1998): 457. ProQuest. Web. 25 Sep. 2014. Module 2. “Module 2: A Brief History of Mental Illness and the U.S. Mental Health Care System.” A Brief History of Mental Illness and the U.S. Mental Health Care System. Unite For Site. Web. 15 Oct. 2014. How can I cite this source in the text and reference part?